This Friday was a pretty exciting night for me…a premiere at the NAC! Never done an opening night there, and there’s always something really nice about checking out a show at the National Arts Centre. It just has a swanky vibe, you know? Once you step inside its hallowed halls, no matter how much of a ratfuck shitbag you are (and you are, stop lying) you just feel classier somehow. I think its all the little lights. But like I said, premiere! 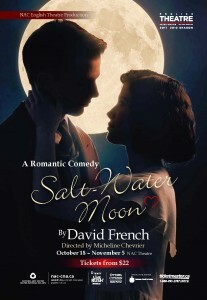 And for the season opener no less, a new production of SALT-WATER MOON from Canuck legend David French. Illiterate that I am, I am woefully unversed in Messr. French’s work (save for the Algonquin college production of THAT SUMMER earlier this year) , but was happy to immerse myself in his world for the evening. In a pre-show talk from director Micheline Chevrier and NAC Artistic Director Peter Hinton, I (and the several hundred other hoi polloi present for the event) learned that SWM is one of a series of plays written about the Mercer clan, at various stages of their history. I’ll be honest, that sounds pretty cool. This particular chunk of the story takes place in Newfoundland post WWI, and one night when Jacob Mercer (Jamie Mac) returns to the rock after running away to Toronto for a year, and tries to win back the girl he left behind, Mary Snow (Holly Gauthier-Frankel). 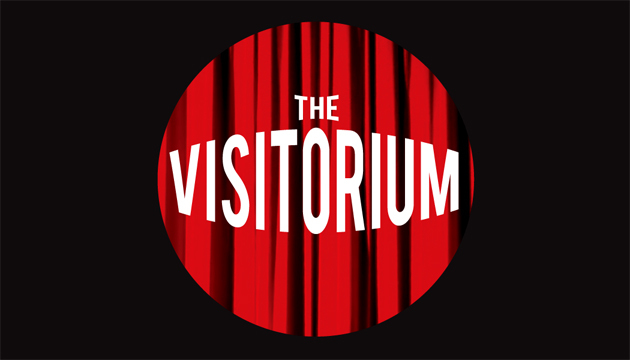 The whole play is a single scene, on a stylized, angular set standing in for a Newfoundland pier. French’s dialogue is a delight to the ears, and I was hooked early on in this show, laughing out loud just where he would have wanted and leaning forward with eager expectation a few more times than I care to admit. I didn’t realize until I read the program that Jamie Mac was the artist formerly know as James Stuart MacDonald in the GCTC/NAC co-production VIMY last year, but I was sure glad to see him again. Especially once I saw how very, very thoroughly he owned the role of romantic rogue Jacob Mercer, with a song in his heart and not a boot-stomping step out of place. Watching him pull out all the stops to woo his old flame, potentially lost to a loathed family rival, was utterly enthralling…and Holly Gauthier-Frankel gave just as good as she got as fiery Mary Snow, proud and strong and never letting Jacob forget either. The two of them played and duelled well off one another…which is excellent, since that’s basically the entire show. The script is a treasure trove of Newfie lore, Canadiana, and romantic longing, and the gang do great work bringing it all to life. The set may not be to all likings, but I for one thought it was dead cool. And Jock Munro’s lighting was mostly gorgeous, tho a few effects seemed to be there just to be there, you know? Or more likely, I was too dumb to get it. Anyways, that’s me done being critical…I had a heartwarming blast at MOON and would gladly soak it all in again if I got the chance. A great start to the season. Thanks for a great review, your critical voice is great, and unlike most people it’s heart-warmingly self deprecating. I laughed. Let me know if you want to come to another show and I’ll save yah a ticket.